Not convinced? If you answer ‘yes’ to one or more of the following, we’re here to help. Feeling a little overwhelmed now? Have no fear. We’ve been there, and we’ve got a simple plan to get you back on track. Step 1: Reorganize your closet. We don’t mean tidy it up, we mean overhaul it! Take everything out and review each piece – you may even find items you forgot you owned! Keep anything you’ll wear again. Donate anything you won’t. Then, decide on a new organization system. Organize by color, by layer, by style, whatever will give you a fresh perspective. We only recommend that you NOT group outfits together. That way, you’ll have the opportunity to create new combinations every time you get dressed. Step 2: Identify your existing colors and trends. 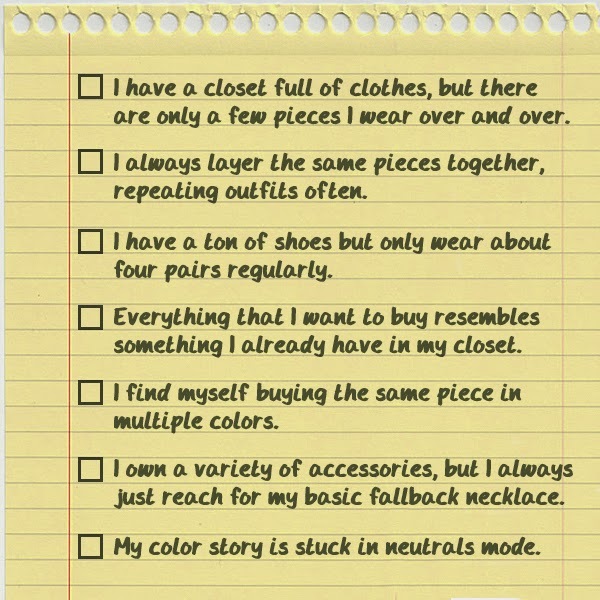 Now that you’ve had a fresh look at your wardrobe, make a list of the colors and trends you already own (especially the ones you own A LOT of). Keep this list handy. It will be important in the remaining steps. Which pieces are similar to items you already have in your closet? The list you created in Step 2 will be helpful here. You may be surprised by the look-a-like outfits you can already create. What pieces are you missing? Of those pieces, decided which would work best with your existing wardrobe to create the largest number of outfits. These pieces just became your wish list. Step 4: Hit the mall. With your wish list in hand, plan a shopping day. Your list will guide your search. Go it alone, or grab a stylish friend to provide encouragement and honest critiques. Don’t be afraid to ask the store employees for help, too! At your local Buckle store, you can even set up a free consultation with a personal stylist. Once you get your new-found treasures home, incorporate them into your newly-organized closet. The result of all your work will be a refreshed wardrobe you look forward to exploring each morning! There you have it! Our four step plan to safely emerge from any style rut. Feeling better? Show us the outfits that are inspiring your new fashion outlook!